The U.S. economy is growing at a 1.2 percent annualized rate in the first quarter, based on latest data on domestic wholesale inventory and existing home sales this week, the Atlanta Federal Reserve’s GDPNow forecast model showed on Friday. This was faster than the 0.4 percent pace for the first-quarter gross domestic product that the Atlanta Fed’s GDP program calculated on March 13. U.S. GDP is forecast to expand at an annualized rate of 1.6 percent this quarter, down from the 2.6 percent in the fourth quarter of 2018, according to a Reuters poll of more than 100 economists released last week. In last month’s poll, first-quarter growth had been pegged at 1.9 percent. Meanwhile, the Atlanta Fed said its nowcast of the contribution of inventory investment to first-quarter real GDP growth increased from -0.40 percentage points to -0.02 percentage points after Friday morning's wholesale trade release from the U.S. Census Bureau. After Friday morning's existing-home sales release from the National Association of Realtors, the nowcast of first-quarter real residential investment growth increased from -4.8 percent to 0.6 percent. The next GDPNow update is Tuesday, March 26. However, the U.S. economy is already slowing, partly due to the fading of a major fiscal stimulus in 2018. The New York Federal Reserve said one of its forecasting models pointed to a 1.29 percent growth rate in the first quarter. That's well below the 2.9 percent growth clocked in 2018, which was just below U.S. President Donald Trump's 3 percent growth target. If the U.S. were to fall into recession, some economists have argued that the federal government’s giant budget deficit could limit its ability to support growth. The federal government posted a $234 billion deficit in February, up from $215 billion a year earlier, the Treasury said in a monthly report. 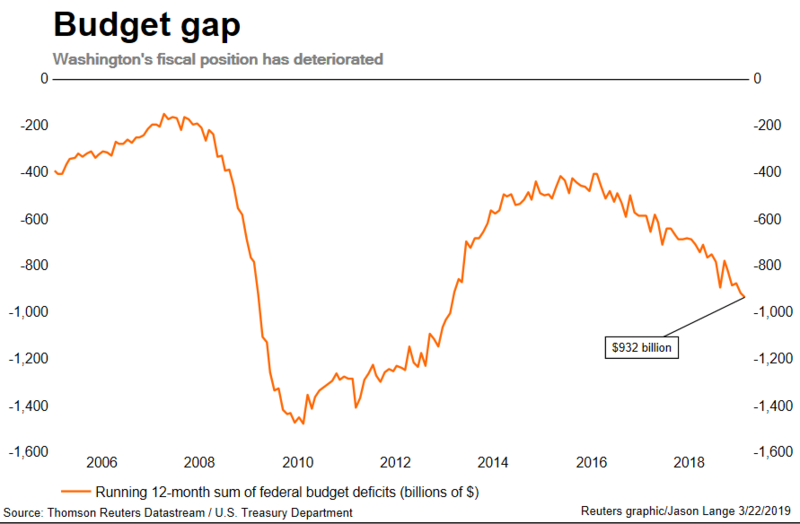 The fiscal situation has deteriorated following a large tax cut enacted in 2018, with the government running nearly $1 trillion into the red during the 12 months through February. In another potential ding for the economic outlook, Commerce Department data showed U.S. wholesale inventories increased by the most in more than six years in January. While that could boost the standard measure of economic growth during the first quarter, it could also be a sign that lackluster consumer purchases are leading goods to pile up on businesses’ shelves. “(This) points to some weakness in final demand,” Barclays said in a note to clients. As for Friday's economic data, home sales surged in February to their highest level in 11 months, a sign that a pause in interest rate hikes by the Federal Reserve was starting to boost the economy.